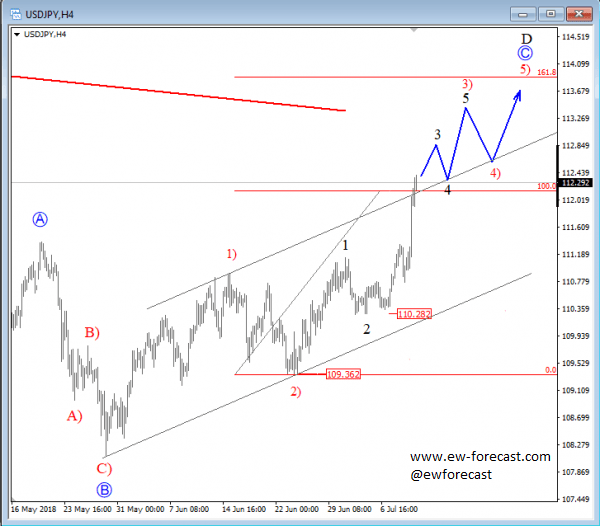 USDJPY can be trading in a bullish impulse since end of May when a corrective wave B of a higher degree found a low. Current price activity is clearly bullish with five minor waves within red wave 1), followed by a corrective leg 2) and now again a new three-wave recovery with latest sharp and steep rally from 110.28 resembling a wave 3 of a bigger cycle. Ideally price will continue even higher within a bigger impulse labeled as blue wave C which can in weeks ahead aim for the 113.5/114 area. That being said, be aware of temporary pullbacks which may pop up within the uptrend.